I'm shocked. I thought he'd make it to 100. He always looked fantastic. Me too, he took great care of himself and was in good shape. Not sure of the cause of death yet. Big Boss Man wrote: Me too, he took great care of himself and was in good shape. Not sure of the cause of death yet. It may be cancer because he was privately bad off all year they're saying now. OK thanks, yea that would explain it if he was feeling unwell. Match from one of the greatest ever feuds in wrestling history. In the Observer bio Dave says Pope John Paul II was a fan and met him privately to give him blessings and to talk to him about his career. That's pretty major. Hogan didn't get that and he's Catholic too. That was a perfect pairing: Roddy at his height of being a heel and the most beloved wrestler in the Northeast. That promo took 35 seconds to get the crowd hot. Who could get trash thrown at them that fast today? Meltzer said last night that Bruno had heart problems since he was a child but never told anyone. So it was heart damage that finally caught up to him and the stem implant he'd gotten a decade ago stopped working. He had been in the hospital for two months but requested it be kept secret. Ex-WCW announcer Chris Cruise was the only non-family member who was allowed to know because he was Bruno's best friend. So basically his heart just gave out and it wasn't cancer as some speculated. I'm sure his funeral will be massive. Thanks for the update. Didn't know he and Chris Cruise were friends. Off topic but I liked Chris as an announcer he used to do WCW Worldwide if I'm correct. Yea Bruno's funeral should be massive. He deserves a great send off. 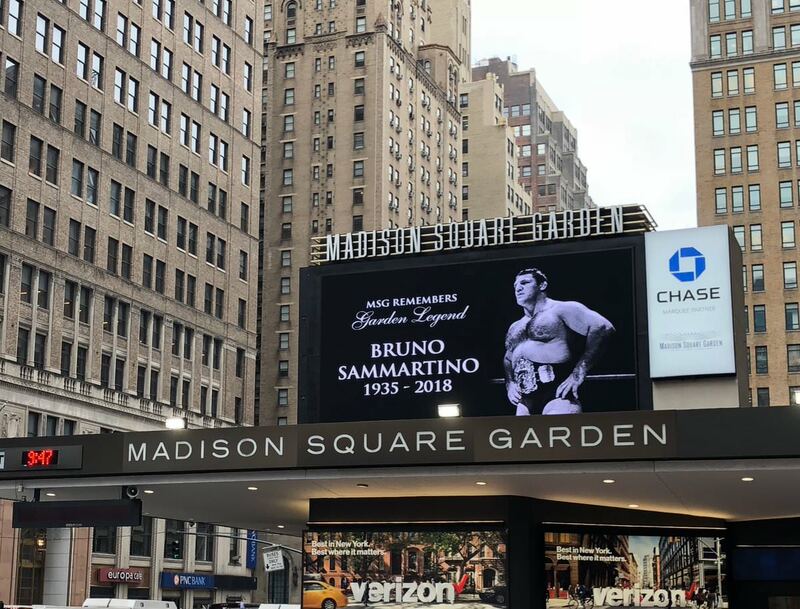 Nice to see MSG pay tribute too. WWE should create a Bruno Sammartino memorial trophy where the top stars compete for it. In the last few years Cruise was on WCW Pro (the Saturday morning show) with Dusty and sometimes Heenan, but quit in 1996 when he was the victim of pay cuts needed to afford Hall & Nash. He owned some kind of business that was successful in Pittsburgh so never tried to come back because WWF wasn't interested and that was the only other place to make money. Yea he announced with Larry Z (I think) and time frame was like late 93 & 94. Weirdly ITV dropped WCW shortly after Hulk came in. I think TNT picked it up a while later but you'd think they'd have kept it. It was shown during the night again but the boom had passed here by like late 92. Yeah in 1995 they put Schiavone and Heenan on Worldwide and put Cruise with Dusty and Zbyszko or Heenan filling in for Zbyszko on Pro. I think because they turned Main Event which Heenan and Schiavone did into just a clip show only hosted by Mean Gene. OK cool. We got WCW Pro from like I'm guessing sometime in 91 with DDP as one of the announcers then they took it out of night time programming to Saturday afternoons as WCW Worldwide with Tony and Jesse. Then when the boom fizzled out back to the night schedule. Sky though had WWF from like 1989 and think they got World Class or some promotion which did coal miners glove match. Time frame would be like 90/91 I think. Never found out what promotion it was.